In today’s age, I think parents feel like they are watching time fly by as their children reach adulthood far too fast and far unprepared. So often we do not realize the impact of our choices until the impact has set in as normal, i.e. shows we allow them to watch, movies, games, etc. Not only that, but we are bombarded from all angles about what normal looks like, how parents should relate to and with their children and also what family even means. Jim Burns and Jeremy Lee have partnered together to write a book that will help parents of all ages of children navigate these challenging years. 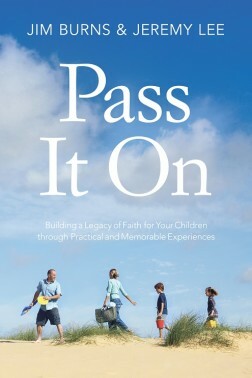 Pass It On is a book that will give practical hands on ideas and tools for parents to connect with their kids and to pour truth into their hearts. Building a legacy is something all of us strive to do, at least I think it is. We are reminded every time we go to a funeral just how precious life is. We are reminded that one day we too will be gone, and the only thing left behind to show we were here are the people who’s lives we impacted. When we pour into our children, teach them to respect authority, to take responsibility and to have accountability for their actions we are raising leader for tomorrow and leaving a legacy. Jim and Jeremy spend thee chapters defining legacy and God’s blue print. Very quickly they change gears into explaining and outlining a schedule of Rites of Passage Experiences. There 12 experiences, each has a chapter so you can really understand the goal and get ideas of the execution. Each year of your child’s school years they suggest you have a Rite of Passage Experience. Each year you layer a new subject on top of those already laid down. Each year or experience is age appropriate, and each chapter even goes into an explanation of where your child is at that season of their life. I felt that the chapters that addressed the ages of my children were quite appropriate with their descriptions of what is going on in their lives according to their ages. Then they offer a Rite of Passage for that age, several discussion starters for the parents and they even have a few questions that your children may ask, so you can be prepared, as you go through the entire process. I honestly think this is an amazing resource. One of the parts I liked was at the end of each chapter you can read about what a child that age is like, physically, emotionally, and relationally – for boys and girls. This is a great tool you can even share with your child, I am personally in favor of showing them why the act the way they do so maybe they can be less frustrated that I was. So much of growing up is hormonal and chemical changes going on, but I think if they know it is normal and everyone else is experiencing it too, would make it seem less scary and crazy! This is a great book! A great resources for parents of kids ages Kindergarten through 12th grade, and even before the kids hit kindergarten it would be a good resource to be reading through and understanding. NOTE : I was offered a copy of Pass It On by LitFuse.